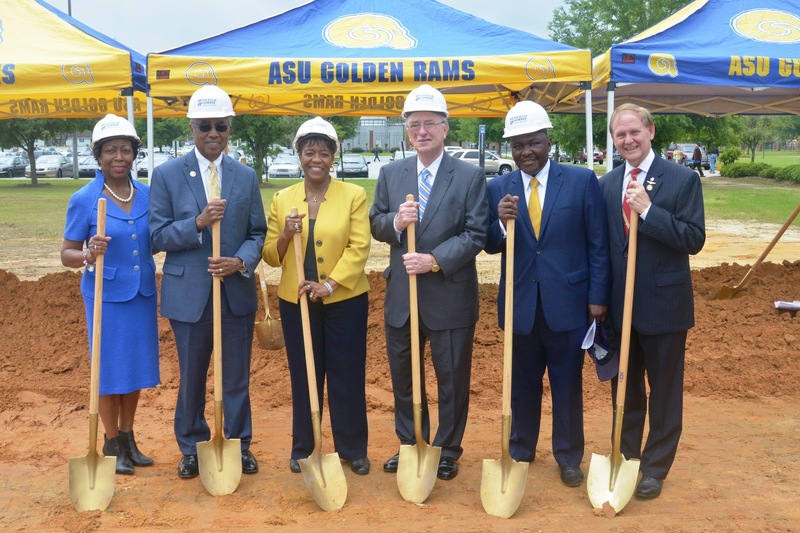 ALBANY, Ga. – After nearly 16 years of delay, university administrators and local and state officials melded shovels with earth to signify the start of construction for the state-of-the-art Fine Arts Center. “It’s been a long-time coming,” Albany State University President Art Dunning jokingly said Tuesday to a crowd of about 130 faculty, staff, student supporters, and Darton colleagues at the formal groundbreaking of the 80,000 square-foot facility. The Fine Arts Center will be located on the upper campus, between the Billy C. Black Building and Residence Hall 5. The structure has a $25.1 million estimated total cost and is expected to open fall 2017. Art, music, speech, theater and music education will be moved from Holley Hall into the new facility. Despite past financial woes and political dilemmas along the way, the new structure will soon be a reality. Local and state delegation support was crucial, Dunning said, in assuring that plans for the building moved forward. “All of us have lobbied long and hard,” said State Sen. Freddie Powell Sims. “This facility belongs to Southwest Georgians, to increase awareness in the arts and add much needed classroom space.” Powell and other lawmakers pulled together in 2015 after funding for the center was, once again, pulled from the supplemental state budget. Professor James Hill, chair of the English, Modern Languages and Mass Communication department, said this will be only the second fine arts building at Albany State in more than 50 years. Designed to achieve maximum space and utility, the building will incorporate more than 50 professional staff offices, 12 classroom labs for English and general instruction and eight studio art classrooms. “Having a state-of-the-art facility that not only broadens the academic experiences of fine arts students like me, but one that will also provide enriching opportunities for everyone in the great Southwest Georgia region is something of which to be proud,” said LaDiamond Lett, a third year ASU theatre major. The ultra-modern building will also include a band rehearsal room, instrumental and choral rehearsal spaces and a “black box” studio theater. An art gallery, Dunning said, will be named for Professor Emeritus Arthur Berry, who played a crucial role in the development of the ASU Fine Arts department from 1967 until his death in April 2015. In 2011, during a visit by University System of Georgia Chancellor, Hank Huckaby, Hill made the case of why the center was a much-need facility for Albany State. After visiting a similar facility at Columbus State University, Huckaby said the difference was “eye popping” and he understood the necessity of the new building. To see a recording of the groundbreaking ceremony, please visit http://www.asurams.edu/fineartstream/.